Star Wars: The Last Jedi. Meet R2D2 and hang out with Stormtroopers from the 501st Legion. Learn whether the planets and physics in the Star Wars universe could actually exist. Thursday, December 14, 2017, 6:30 p.m. to 1:30 a.m.
Get in on a private screening of Star Wars: The Last Jedi. But first, a party at the Fleet. Meet R2D2 and hang out with Stormtroopers from the 501st Legion, join the Underground Lightsaber Fighters for lightsaber battle training, enjoy drinks and food from local restaurants and breweries, watch local artist Daniel Jaimes create Star Wars–inspired art, participate in themed science activities, and learn whether the planets and physics in the Star Wars universe could actually exist during a “Worlds of Star Wars” talk by Dr. Lisa Will and professor Shane Haggard. Ages 16 and up. Come in costume for a chance to win prizes. Grammy-nominated saxophonist Dave Koz returns to Balboa Theatre with his newest Christmas production, a 20th-anniversary tour that reunites him with two players from his original holiday tribute, pianist David Benoit and guitarist Peter White. The evening includes contemporary renditions of yuletide classics and a Hanukkah medley and tracks from each player’s catalog. Joining Koz and company is Dallas R&B singer Selina Albright, whose 2013 release Brighter topped the UK Soul chart. Friday, December 15, 2017, 6 p.m. to 9 p.m. Lurking in the depths of many people’s closets is a colorful, abundantly adorned, downright hideous holiday sweater. The Ales ’n’ Rails Ugly Christmas Sweater Party is a light-hearted fundraising event with a serious aim to fund unique exhibits, public programs, and the operations of the museum. $30 gets you unlimited tastings from local craft breweries Mike Hess Brewing, Pizza Port Brewing Company, Benchmark Brewing, and Rock Bottom Brewery La Jolla. Ice skating and hockey for the first time at Del Mar Fairgrounds. This first-time holiday ice-skating and hockey event is held in the Del Mar Fairgrounds’ covered main arena with two separate skating rinks: the Community Rink (the largest holiday ice-skating rink in San Diego) and the NHL Hockey Rink (the first full-size outdoor ice-hockey rink in SD). The event features a Hockey Fan Fest with themed off-ice attractions, including a custom-made ice-hockey rink jump house, a hardest-shot and accuracy-shooting challenge, and a mini street-hockey rink. The community skating rink is holiday themed with music and lights. Holiday half marathon. The only real hill is at mile 1.5. Saturday, December 16, 2017, 7:30 a.m. to 11 a.m. This fast 13.1-mile course starts on Peñasquitos Drive in front of the Hotel Karlan and travels southwest along Carmel Mountain Road (the only real hill is at mile 1.5), the 56 bike path (with a 711-foot net elevation drop), and finishes at Torrey Pines State Beach. Tomahawk-throwing, rope-making, slingshot range, tug-o-war, gunnysack-racing, hoop-and-sticks relay, plank-racing, and the tire swing. Saturday, December 16, 2017, 10 a.m. to 4:30 p.m. Things to do include a holiday hayride with caroling, Christmas jug-band show, candle-dipping, rustic-ornament making, cider-pressing and tasting, petting zoo, tomahawk-throwing, rope-making (for kids too young to throw tomahawks), ghost-town slingshot range, Christmas fairy and dino garden making, Julian olde-time photo costumed photography, tug-o-war, gunnysack-racing, hoop-and-sticks relay, plank-racing, and the ever-popular tire swing. $20 (some events have an extra fee). Make and take a dreidel, mkeka mat, or a necklace or bracelets in traditional colors. Sunday, December 17, 2017, 11 a.m. to 4 p.m.
Make and take a dreidel, mkeka mat, or a necklace or bracelets in traditional Kwanzaa colors. Performances by Rev. Alyce Smith-Cooper (sharing African-American ancestral storytelling) and the San Diego Jewish Men’s Choir. This event is held in conjunction with the San Diego History Center’s exhibitions Legacy in Black and Celebrate San Diego: The History & Heritage of San Diego’s Jewish Community. 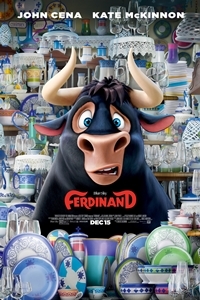 Ferdinand. The running time has been padded by 98 minutes. It began in 1938 as one of Walt Disney’s charming eight-minute Silly Symphonies. This time around, the running time has been padded by an additional 98 minutes, leaving John Cena ample time to prove he’s secure enough in his masculinity to tackle the role of the legendary flower-sniffing bull. How the feature compare to the short? Movie critic and cartoon maven Scott Marks has the answer.